Kumi Kookoon Classic Charmeuse Silk Sheets, pillow covers and duvet covers are made of the finest selection of naturally dyed chemical free silk. Kumi Kookoon, one of the finest makers of silk bedding, takes great pride in using only grade A raw mulberry silk. The raw silk used is produced by Bombyx Mori silkworms that are fed only pure mulberry leaves. Mulberry silk filaments are finer and have a more consistent filament width than silk produced from wild silk filaments. Silk in addition to being luxurious, is hypo-allergenic and inhospitable to dust mites. The weave of silk is so much finer than cotton, and is measured in momme rather than thread count. Kumi Kookoon's Classic silk collection are 19 momme.You will love the rich sensuous feel and elegant luster of these 100% Charmeuse silk sheets. There's nothing more comfortable or inviting than wrapping yourself in soft smooth silk, known as silk of the emperors. Bring a new realm of sensations to your bedroom. * twin size flat sheets are special order. ( some colors are stocked) but may take 8-12 weeks for delivery. 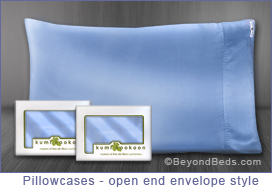 * twin and full size fitted sheets are special order (some colors are stocked) but may take 8-12 weeks for delivery. * twin and full size Duvet Covers are special order. (excluding white and ivory) Please allow 8 to 12 weeks for delivery. Click Here to learn more about Kumi Kookoon Classic Duvet Covers. 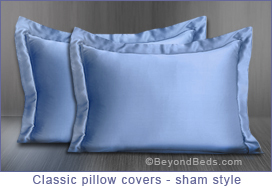 Click Here to learn more about Kumi Kookoon Classic Pillow Covers. 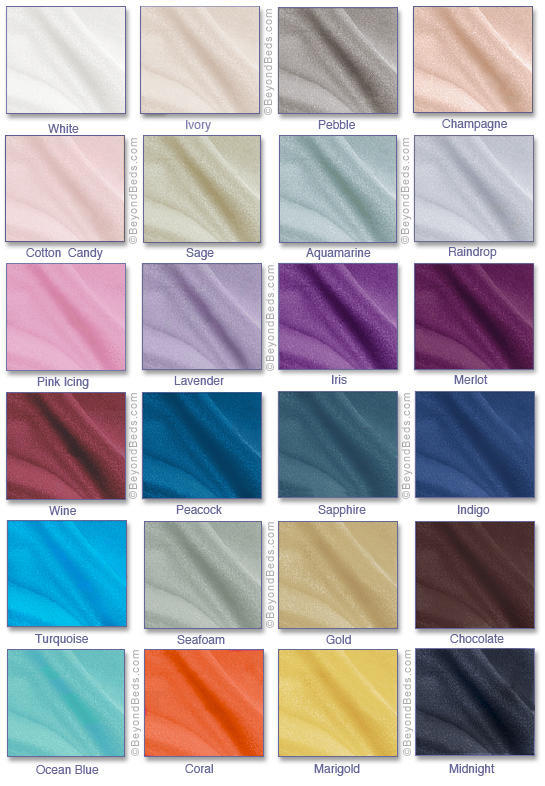 Kumi Kookoon Classic Collection Colors: White, Ivory, Pebble, Champagne, Sage, Aquamarine, Raindrop, Wine, Merlot, Iris, Gold, Lavender, Sapphire, Indigo, Chocolate, Midnight, Snowcone, Seafoam, Coral, Pink Icing, Ocean Blue, Turquoise.